October, 1973. An anonymous jack-of-all-trades in the Chilean city of Viña del Mar felt the sudden urge to look in on his repair shop at a quarter to one in the morning. A series of robberies had taken place in recent days -- the confusing and dangerous times shortly after the Pinochet coup d’état --and the man felt the paltry tools with which he eked out an existence could be taken from him. Walking in the darkness down the street, he was confronted with an unexpected and uncanny sight: an object he described a long, dark thing, "like a cylinder flying at low altitude" (an estimated two hundred meters, some six hundred feet) that flew out of the Andean foothills toward the sea. He convinced himself that it must be some kind of helicopter, perhaps a tool the CIA had given the new regime, but something even more distressing was about to happen. The cylindrical form was approaching him, descending from the heights as it did so. The handyman thought to run and hide, but an inexplicable paralysis gripped his limbs, rendering him helpless, unable to do anything besides look at the exotic object as it came down to the height of the local buildings, moving down the avenue, passing in front of a bakery. 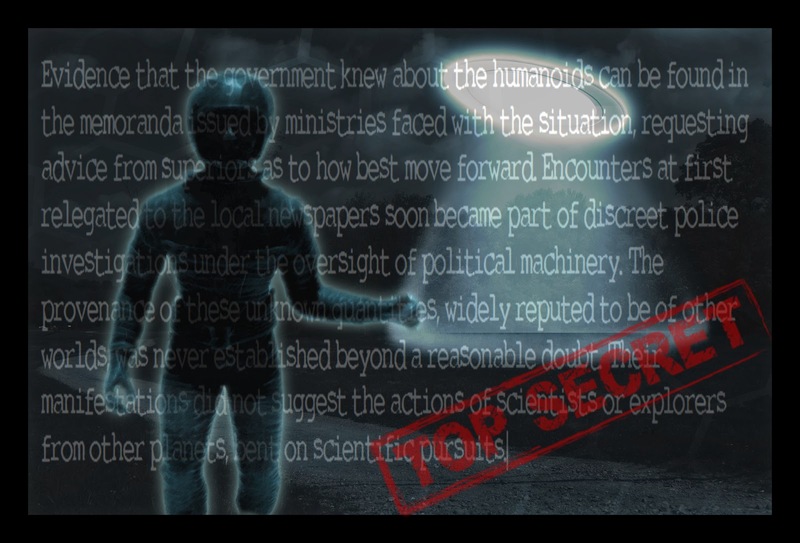 It was then, he told researcher Jorge Anfruns, when it dawned on him that the object was one of the infamous UFOs that people had been discussing so much in the media, and as it came closer in complete silence, casting light on the darkened storefronts, he noticed the front of the object had a transparent bubble containing two "pilots" who exchanged animated gestures with each other. In spite of his paralysis and obvious concern for his own fate at the hands of these creatures, the handyman was determined not to miss a thing. The pilots, he would later say, were dressed in what resembled dark colored skin diving suits with similarly hued gloves and transparent facemasks. Their build was average but slender, identical to that of human beings. The entities in the transparent bubble mentally ordered the handyman to enter into a crouching position ("it seems that they wanted to scan my head or my mind"). Upon looking up, he noticed that the occupants had resumed their seated positions and the object was pulling away in the same manner it had arrived. Freed from the unnatural paralysis, the handyman felt a buoyant, pleasant sensation as he resumed his walk. It was a month before he felt could tell someone about his experience, and when he did so, he was met with the typical jeers suggesting he had imbibed too much of the country's fine wine. Is it reasonable to speculate that the same diver-suited crew in the Chilean handyman's case was also at work across the Andes, in neighboring Argentina? In mid-October 1973, Carlos Baldivares and his son Manuel were surveying an ample rural property on horseback near the town of General Pinto. During the course of their inspection, they noticed the presence of three people whom they first thought were poachers, until closer inspection proved that the human-looking "beings " appeared to be suspended in the air, floating over the waters of a local lagoon. Baldivares described the entities as two males and a female, dressed in form-fitting black outfits. The males were of average height and build, while the female was slightly taller. When Baldivares called out to them, the three figures - whose backs had been turned to him - looked around and suddenly vanished, only to reappear at the opposite end of the lagoon, some three hundred meters distant (1000 ft.). The witness noted that they moved with their arms and legs close to their bodies, and not far from the unusual beings was a rectangular object that emitted considerable light and heat. Earlier that year - specifically on March 13, 1973 - engineer Jorge Herrera, a resident of saucer-prone Salta in Northwestern Argentina, witnessed the landing of an object shaped like "two superimposed dinner plates" (a boilerplate description in classic ufology) on the side of the highway linking Salta to Jujuy. The object, propped on three struts, disgorged a man-like being in what resembled a diving suit. Herrera approached, unable to contain his curiosity, but the occupant also moved, covering ground "without moving his legs" and then vanishing altogether. A number of marks on the ground bore silent witness to the presence of the unknown object. 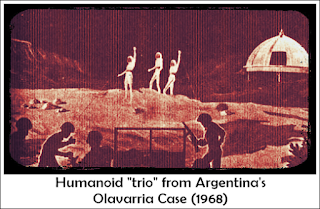 (both cases are from Roberto Banchs's La fenomenologia humanoide en la Argentina, 1977). Accounts involving non-human entities had become commonplace during the 1975. While Chileans coped with the vicissitudes of social and political life (the 6.9 earthquake in the cities of Coquimbo and La Serena, the purge of ministers of the ousted Salvador Allende government and changes in the national currency), some of their fellow citizens continued having brushes with the unknown. An elderly married couple in town of Peumo, located the country's O'Higgins region (70 miles south of Santiago de Chile) was startled to see a bright, unknown object descending from the night skies onto the grounds of their rural estate. Bravely venturing out to face the unknown, they were confronted by two tall humanoid figures wearing face-concealing helmets. These figures, rather than asking to be taken to the country's leader as a bad flying saucer joke would suggest, simply advised the humans - in perfect Spanish - not to be alarmed, since all they wanted was to gather vegetable samples from the property. Stranger still, the man and his wife reported not feeling any kind of distress about the situation and gave their permission. The entities went ahead with their mission and the light of a summer day would reveal the presence of unusual marks on the soil, attesting to the reality of the entire experience. The uncanny experience has an even more intriguing detail. The man's wife was a former officer for the embassy of a foreign power, and promptly advised the ambassador about the event. Whether this senior diplomatic official apprised his country of the event is unknown. On April 17, 1975 Orlando Franceschi, an ambulance driver for a hospital in the city of Ponce, Puerto Rico, on the island's Caribbean shore, returned to his house after 8:00 p.m. that evening only to become aware of the fact that something unsual was going on in his backyard. Franceschi's could see his watchdog jumping into the air in a frantic effort to clear the fence get away from whatever it was. The homeowner, tired after a long day's work, angrily set off for the backyard, taking the precaution to arm himself with a shovel which he kept against one of the house's exterior walls. Nothing could have prepared the ambulance driver for what he found in his backyard: a bizarre entity with long, pointed ears, a long nose, lipless mouth and greyish, ashen skin. Franceschi would later describe it eyes as being "black spots", and having a jawline reminiscent of an ape's. The creature walked toward the homeowner with a jerky, stiff gait. In a mixture of fear and anger, Franceschi struck the five foot tall intruder with the shovel, but was surprised to see that it was unharmed by the terrific blow. Oddly enough, the entity backed off, perhaps deliberately allowing Franceschi to deliver a second shovel-blow without any effect. But when the human was winding up to deliver a third strike, he began to feel his body becoming numb and paralyzed, leaving him at the mercy of whatever it was that could withstand such physical punishment without flinching. Helpless, expecting the worse from the non-human figure, the ambulance driver was shocked to see the entity (which he described as a "zombie") fade into thin air.